The following is a short report on my 2016 solo travels in the NWT. This year, I followed a route that took me through the headwaters of the Abitau, Dubawnt, Elk, and Taltson rivers, east and south of Great Slave Lake. I chartered into Abitau Lake from Ft. Smith, then worked south and east through small ponds and streams to reach the Dubawnt's headwaters above Ivanhoe Lake. 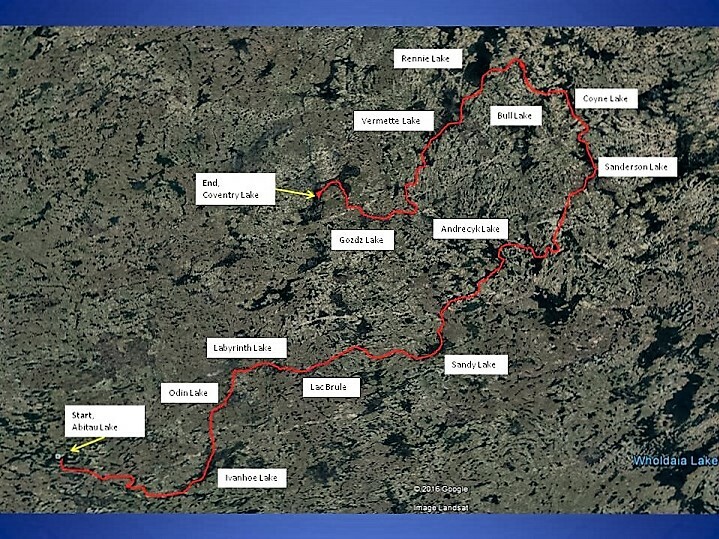 I followed the Dubawnt downstream - through Ivanhoe, Odin, and Labyrinth lakes, and Lac Brule - to Sandy Lake. At Sandy lake I left the Dubawnt, portaging to an unnamed lake to the north and continuing through Andrecyk Lake. I followed the unnamed stream draining Andrecyk north and east to Sanderson Lake, then went upstream, west and north, through Coyne Lake to Bull Lake. From the north tip of Bull Lake the route went west through small lakes and streams to reach Rennie Lake on the Elk River. From Rennie I paddled south through Vermette Lake, and then portaged south into an unnamed but distinctly "H" shaped lake. From there I portaged over an esker, out of the Elk/Thelon drainage into the headwater lakes of the Taltson River, in the Great Slave/Mackenzie watershed. I continued downstream through Gozdz Lake to Coventry Lake, where I was picked up by float plane and returned to Ft. Smith. The trip went well, helped by some good fortune. Water levels were very high in this part of the NWT this year. That helped me navigate what I thought could have been two shallow and tedious stretches - the Dubawnt where it divides above Sandy Lake, and the drainage from Andrecyk Lake - more quickly and easily than I had expected. Calm weather on the lakes of the upper Dubawnt, while less than optimal from an insect perspective, allowed me to build a good mileage "cushion" early in the trip. And, while this area is not frequently canoed, I found several winter hunting/trapping trails along the way, which saved me quite a bit of bushwhacking time. A friend told me that people from northern Saskatchewan - Fond du Lac / Stony Rapids - still travel as far north as Damant Lake in the winter. I assume it was their trails I was following. Some photos follow. I must admit that while this was an interesting area to explore, it was not the most photogenic. The area is mostly a flat till plain: rock outcrops, cliffs, and waterfalls are rare, and so are big sandy eskers. Narrow beaches usually provided the best campsites, often with bog or thick forest behind. Unloading in Abitau Lake: excitement, anticipation, and as always, a touch of trepidation. This fisher loped into my first campsite, then shot up a tree when he noticed me. The first one I have seen in the wild. Winter blazes, on the way to the Dubawnt. Esker view, from second camp. but has grown a fair bit by the time it falls into Ivanhoe Lake. "Narrow beach" camping was a theme of this trip. Here, on Ivanhoe Lake. A rare "Shield" campsite, north of Odin Lake. A ledge on the Dubawnt, above Labyrinth. Another "narrow beach", on Labyrinth. I had been warned by Hoop and another friend who had travelled here that the section of the Dubawnt where it splits above Sandy Lake was short on water and long on rocks, making for hard work and slow travel. But this year's high water made things easier: while some wading and dragging was needed, I was able to paddle most of this section, in the south channel. I was pleased to find a winter trail where I portaged north out of Sandy Lake, and a navigable stream into Andrecyk Lake. But the lack of campsites in the south end of Andrecyk was less pleasing. I had to clamber up a steep peat bank to find a spot clear and level enough to pitch my tent. Campsite to be, Andrecyk Lake. I had been worried about whether the stream draining Andrecyk would have enough water for navigation. But this year, no problem. It had a good flow, and while some wading and hauling was required, most of it could be paddled, and some of it was quite fun. In Sanderson Lake, behind my narrow beach camp, there was a good sized patch of tundra. I was obviously getting close to treeline. In elevation terms, Sanderson (at 367 m asl) was the "low point" of the trip. I now turned upstream through Coyne and Bull lakes, and progress slowed as I waded, dragged, and occasionally portaged upstream. First upstream stretch above Sanderson. Last rapid below Bull Lake. Helped by a serendipitous winter trail on the portage west from Bull, I was now working through some small lakes and ponds to reach Rennie Lake, on the Elk River. Sandy stream, west of Bull. Esker country, east of Rennie. I paddled south through Rennie and Vermette lakes - the main headwater lakes of the Elk River. Both were well endowed with "wider" beaches, which made for excellent campsites. From the south end of Vermette I bushwhack portaged south into an unnamed, but uniquely "H"-shaped lake, and found an excellent sandy campsite at its south end. Portaging over the esker behind camp would take me from the Elk/Thelon system into the Taltson headwaters and the Mackenzie watershed. Like all rivers, the Taltson starts small. A day of wading and portages took me to Gozdz Lake, where I found another narrow beach camp and experienced a wide variety of weather - calm, sun, wind, showers, and a rainbow - all in half an hour. The flow in the stream below Gozdz was enhanced by other tributaries entering the lake. The rapids were navigable, and except for one 50 foot wade in a shallow rock garden, I reached Coventry Lake without stepping out of the boat - a much easier day than I had expected. Coventry provided a final excellent beach and campsite, where I would await my ride home. The only issue was the large and fresh footprints some local resident had left in the sand: but I decided that I was finished, and tired, and I was staying. I never met my big-footed friend. Trip totals were about 365 km, 18 travel days (20 total), and 30 portages. Thanks for reading. I'd be glad to answer any questions about the area or my route. Great stuff, thanks for taking the time to share. I always enjoy your summer exploration canoe trip reports. You continue to add to first hand experience to your vast knowledge of that area. Posting trip reports shares that information with others. Much appreciated. All the photos enriched the details and depth of the information. Here's to many mote successful trips. The plane looks like a 185. The opinion around Great Slave Lake seems to be (according to Dave Oleson) that a Beaver is the smallest plane that can legally carry passengers and external load. Comments? An aircraft can carry an external load if and only if it has a supplemental type certificate (STC) issued by Transport Canada which authorizes it. NWAL, the operators of that 185, spent considerable time and effort obtaining the required STC from Transport Canada, including extensive flight testing with the external load. As a result, they have the required STC - and could as I understand it, "sell" the STC, sort of like a patent, to another operator with a similarly equipped 185. NWAL is currently the only operator in the Great Slave area with an external load STC for their 185, as far as I know. Tindi went through the certification process with their 185s, I think, but then divested their piston fleet and went turbine only. The current 185 operator in Yellowknife, Open Water Charters, does not (last time I looked) have an STC for their 185. I suspect that for many operators who don't do a lot of "canoeing" business, the time and effort to acquire an STC just isn't worth it. Another great trip JMC! I really enjoyed the photo report. I am continually in awe of your abilities to travel upstream and across watersheds to link up rivers and watersheds, all solo too. Very glad to see NWAL's 185 is still working external tie-ons for solo canoe trippers. Always very interesting locations, great pictures and descriptions. You must spend a lot of time looking at maps. I look forward to your next adventure.